It is hard to believe that by downloading a mobile application you can do something good for your health. Actually, you can. It is possible if this mobile app relates to healthcare industry. Nowadays, world has improved so much that we can have a video consultation from a qualified physician on health issues without leaving home, ask for help in case of emergency by pressing a button on our phones, find out what is the name of the disease we are likely to have by just putting down the symptoms on our gadget, get a workout plan according to our needs and preferences using a mobile app, etc. Healthcare app mobile industry is getting hugely popular and profitable with new ideas coming up and new startups appearing all the time. So, let’s take a look at bright representatives in healthcare mobile projects area with considerable amount of users. 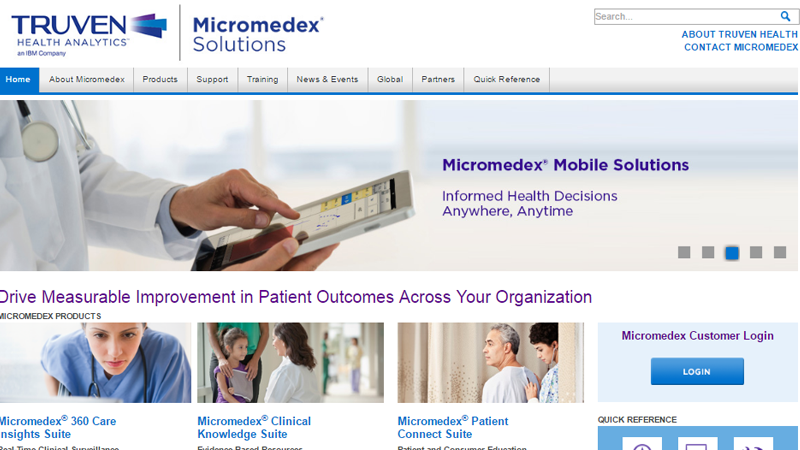 Micromedex is a healthcare mobile application with a considerable drug database. If you face some health problems, you can easily find drug recommendations for yourself by typing the symptoms of your ailment. Also, there is extensive information about drugs, so if you want to know about a specific one you can look it up there and receive instructions to this medicine, information about the proper dosage level and potential side effects. It is really easy to use, updated every month, and doesn’t require internet connection. This app is available on iOS and Android. Micromedex Drug Reference is free of charge to those who have an online subscription to Micromedex 2.0 products. For those who don’t have it, there is non-subscriber version of the same app – Micromedex Drug Essentials. WebMD is a comprehensive healthcare mobile app. It includes WebMD’s Symptom Checker, Drugs & Treatments, First Aid Information and Local Health Listings, and other useful features. If you experience some specific symptoms you can use WebMD’s Symptom Checker – choose the part of the body, note your symptoms, and review the information about possible diseases. You can also research conditions, have access to large drug database, identify the medications, receive helpful treatment tips, and find the closest hospital, physician or pharmacy to the place you are located. In addition, you can get the first-aid information without having access to the Internet. WebMD is free to use and available on Android and iOS. Epocrates is very popular drug reference app with a great deal of users. It is widely used among healthcare providers, students, and physicians. This healthcare app is famous for its huge drug database, which includes dosing information and instructions, side effects, cautions, safety recommendations, pharmacology, etc. Also, Epocrates offers such useful features as drug interaction checker and pill identifier. Moreover, with this application you can contact manufacturers directly if there is a need for it. Epocrates provides free access but there is also paid version available with additional features. Among these features there are alternative medications, compilation of clinical practice guidelines, diseases information including medical data on different conditions, lab guides, and ICD-10 code lookup. Epocrates is also available on Android and iOS. Doctor on Demand application allows having a video consultation with a doctor just using your phone. Through video chats doctors can provide assessment, diagnosis and, if there is a need, prescriptions for you ailment. Physicians on Doctor on Demand deal with allergies, colds, and infections of different kind. What is more, it offers psychologists, who treat depressions, stresses, addictions, or even relationship issues. This application gives access to more than 1,400 doctors and 300 mental health professionals. You are able to check their profiles and choose the most suitable option for yourself. Furthermore, in case you cannot imagine how it works there are explanatory pages and videos for making it clear. Doctor on Demand is free to download and sign up from Android or iOS. But, obviously, you have to pay for the consultation itself. When it comes to prices, it depends on the kind of specialist you need. The cheapest are medical doctors, then come psychologists, and psychiatry is the most expensive here. In addition, there is the possibility of insurance coverage depending on the insurance company. UpToDate is a widely known and established online healthcare service, which is used by many individuals and institutions. There are both website and application versions of UpToDate. This app allows its users to get answers to any clinical questions, which bother them. It provides massive medical database with useful references and guidelines via easy-to-use and intuitive user interface. The app offers extensive base of articles, which is constantly updated and reviewed by specialists of healthcare industry. Also, there is strong library of calculators, which is on the level with other medical calculator apps. In addition, there is language converter for choosing the language you want. Nevertheless, the app can be used online only. UpToDate can be downloaded on both Android and iOS. However, with free downloading there comes paid subscription (individual or institutional). Round Health advertises itself as a “better way to remember your medicine”. It is a medication reminder application for scheduling your pills intakes. If simple reminders on your phone are not enough and you want something more specific and professional, it is worth trying out. This app strives to make it easier to remember when you have to take your pills in the most effective way. You just choose a medication, proper dose from the list or enter your custom dose and a timeframe. Then, there are flexible “reminder windows” due to your medicine and timetable you set appearing on your phone. The app also has a pill calendar for oral contraceptives, which includes placebo pills and reminders for them if there is a need for that. Round Health is free to download and use. However, it is only available on Apple products. Red Panic Button is an app that can be extremely useful in case of emergency. It requires just pressing the red button on your phone to send emails and text messages to those who can help you. You bring in the list of people and their contacts, who must be reached if there is an emergency situation. Then, if anything happens and you press red button they receive signal with your location (GPS or Network based coordinates). There is also configuration with Facebook and Twitter available. Red Panic Button supports all Android and iOS devices. It is free to download and install with in-app purchases such as no ADS or photo/video/audio panic emails, etc. available. As long as fitness belongs to healthcare, it does make sense to mention fitness applications, which also call for huge demand nowadays. Zombies, Run! is a story-based workout application, which makes the running process much more fun. This app offers whole zombie adventure story with audio drama, where you become a hero and your runs are your missions. You have to rebuild civilization by collecting different items (batteries, clothes etc.) and avoiding zombie hordes. There are different missions users can choose from, which imply different pace. In addition, you can listen to the music from your own phone library while running. There is also ZombieLink if you have desire to share your achievements with friends and compare your results to theirs. This application is free and you can download it both on Android and iOS. There are also various in-app purchases available. Besides, Zombies, Run! offers Pro version, which includes ability to unlock more than 200 story missions at once, Interval Training, and Airdrop Mode. StrongLifts 5×5 is a mobile application for building muscles, burning calories, and just becoming healthier and stronger. There is pretty simple system lying in the core of this app. Stronglifts 5×5 offers five weight compound exercises: the Squat, Bench Press, Deadlift, Overhead Press, and Barbell Row. There are two full-body workouts, A and B, which include 3 types of exercises from above each (Squad is in both). This way, you train three times a week, choosing workout A or workout B for 45 minutes each. 5×5 in the name of application means that there must be five sets of five reps done on every exercise (except Deadlifts, which requires one set of five steps). After all, app gives you set of exercises for you for each workout, the amount of weight you should add, and how long the break between sets must continue. StrongLifts 5×5 is available on Android and iOS and free to use. There is also a number of optional in-app purchases you can buy. The name of this application says everything about itself. Yes, Lose It! is about losing weight. It tracks the food you take and fitness activities you do. Let this application know the basics about you, such as your weight, height, age and a particular amount of kilograms you aim to lose if there is one – and you receive a custom weight loss plan just for yourself. This application lets you set your goals, track your food intake and exercises by searching for them in its extensive database, scanning or snapping, connect to other fitness or health apps and devices, and just get the nutrition and fitness program for weight loss and staying healthy. Lose It! is free and can be downloaded from Android or iOS. It has additional features which are available only with premium subscription. Strava is about running and cycling. Its functions enable recording running and cycling sessions, comparing performance results, competing with the others, as well as sharing photos and impressions. This application does excellent job with tracking your runs and rides. Strava provides tracking the distance covered, speed, the amount of calories burnt, heart rate, cadence, etc. You can see this information structured in accessible graphics. This application has a strong community of cyclists, and lets you interact with them. It also arranges personal challenges for growing and getting better results. Furthermore, Strava is a friendly device and works with numerous GPS running watches and activity trackers. As usual, this application is available on Android and iOS and it is for free as well. In addition, it gives you access to the premium features through in-app purchasing. Sworkit is one more mobile application in fitness area. The name of this app stands for “Simply Work It”. With this application you can create your own custom workouts or choose standard workout plans. Sworkit offers huge collection of videos with exercises demonstrated by different personal trainers. All you have to do is let the app know which type of workout you need (cardio, stretching, etc) and how much time you can devote to it. Then, you choose your trainings and follow the instructors in videos. This way, having got your workout plan you need no equipment or gym to do your exercises. Moreover, it has syncs with Google Fit & MyFitnessPal. Sworkit is free to download on iOS and Android. 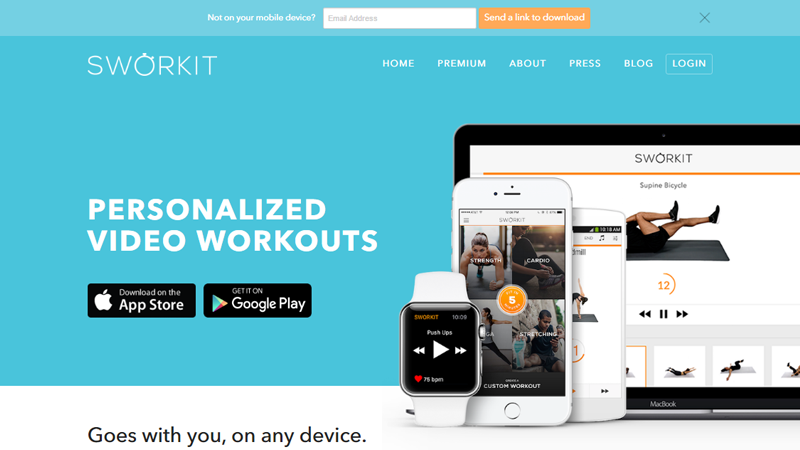 There is also Sworkit Premium with additional features, such as ad-free workouts, exclusive exercises for beginners and older adults, ability to save an unlimited amount of custom workouts, ask-a-trainer support, etc. Appаrently, mobile apps have made a change in the healthcare industry and they keep this ball rolling. There is no doubt that, when it comes to healthcare, mobile applications make it more effective and efficient, introducing new and easily accessible functions all the time. Moreover, there is no doubt, that creating mobile healthcare application with useful features and valuable content can be a great idea for making a successful and profitable startup. And the applications listed in this article have clearly proved it.